He will need to use all the survival skills his dad taught him to stay alive… and decide which side he wants to fight for. I wrote about half of Scavengers during July 2013’s Camp Nanowrimo. After that, I didn’t work on it steadily for a while. In September 2013 I published Hitchhikers and then I wanted to focus on finishing Dreamwalkers (May 2014). As you can see from my word count progress above, I started gunning to finish Scavengers after Nanowrimo 2014. At that point I had pushed the release date for Scavengers back once. Up until the midpoint reversal in Scavengers, the plot had been somewhat contained: Zeke and his kidnappers traveling together, the kind of small group scenario I enjoy writing. Once more characters entered the picture, I had to do a lot of backtracking through the previous books in the series to remember exact details about places, characters, and events so the overlapping stories didn’t conflict. Scavengers takes place during the tail end of Hitchhikers and the latter half of Dreamwalkers. I hadn’t realized how difficult it would be to write the third book in a series. Honestly, it made writing the first book seem super easy! When I was first designing a cover for Scavengers, I knew I wanted it to match the first covers of Hitchhikers and Dreamwalkers. 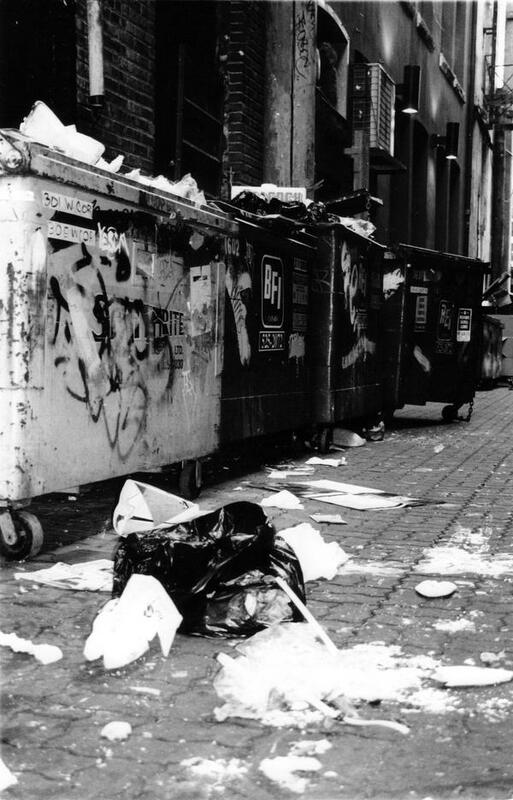 I wanted Zeke’s cover to be green, and I needed a person who looked vaguely like Zeke, and a background of an alley with trash or dumpsters or an urban environment. I couldn’t get permissions for either image (Background: Czech Republik by Anna Moreno; Person: boy XVII by Ophelia Cherry), I also didn’t feel like this person look much like my vision of Zeke – a little too old and punk-looking. But I had the basic design I wanted. The first draft of this cover I couldn’t get permissions for either image (Background: Czech Republik by Anna Moreno; Person: boy XVII by Ophelia Cherry), I also didn’t feel like this person look much like my vision of Zeke – a little too old and punk-looking. But I had the basic design I wanted. I then began looking on Deviantart but again didn’t have much luck getting permissions. The second and third draft is I believe the same person and he looked a lot more like my vision of Zeke. I found both of these images on Morguefile, which is a great site because people put their photos up wanting you to “remix” them. You still have to contact them for permission if you want to use them commercially. The design of the cover didn’t change much over its many incarnations. In the end I wasn’t totally happy with this cover.